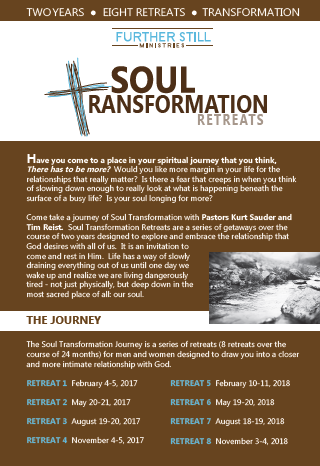 The 2015-2016 Soul Transformation Retreats that I have co-hosted with Tim Reist have been an incredible experience for all involved. 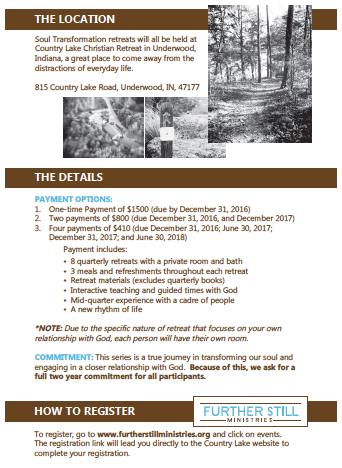 We are excited to share that spots are now open for the 2017-2018 Soul Retreats. This year, we will not only include men but we want to invite women to join us as well! Below is a link to all the information you need. Feel free to contact us with any questions. We are excited for what the Lord will do through this next soul journey. Hi. Just wondering if there’s any sort of early registration discount for the Soul Transformation Retreats. Figured I’d ask. Thank you! Yes! If you pay for the retreat all at once now, you save a little money rather than paying for them in segments. Please find the information here…http://furtherstillministries.org/soul-retreat/. What are the hours schedule for the retreats? Appears you start on Saturday and go into Sunday. Hi Bob, I am trying to figure out the exact schedule and will let you know ASAP. The last two years, I believe they began around 4 or 5 PM on Saturday and they finished around 5 PM on Sunday. And as far as taking advantage of the one time payment discount, I will also get back with you and let you know soon! Thanks for the information. So I can just choose annual payment on the event page for one year commitment. Correct? Also are the sessions going to be men and women together, or separate sessions? Hi Bob, Please forgive my delay. I believe my Dad called you to discuss this? Were you able to work out the problems?